If you’re like me, you have feelings for your coffee mugs. Your collection is a thing of pride. Each piece is filled with morning memories, inner monologues, and the story of how you first laid eyes on it, whether it was at a hip pop-up shop or some gas station off the 1-40 East where the white porcelain stamped with “Amarillo, Texas” shone so brightly it reached your soul and you couldn’t continue the road trip without it. Each mug is part of you. As I’m always on the lookout to expand this collection, we’ve rounded up our favorite local ceramicists whose clever designs and attractive color schemes keep us wanting more. Scroll through these ceramic beauties while you daydream about those peaceful mornings with your future mug. And maybe fantasize about that iconic Ghost scene, wishing you were a clay-splattered Demi Moore passionately sculpting alongside a bare-chested Patrick Swayze. We’re big fans of Uno+Ichi, brainchild of duo Hana Ward and Joanna Lee, who run their brand out of a backyard studio in West Adams. What started as a small passion project has boomed, and now their ceramics can be found in shops across the U.S. and as far away as New Zealand. The duo’s trademark is the personified mug, with a reel of characters coming to life through beady eyes, pinched noses, and stoic expressions. We’re partial to the “Unibrow Niñas” mug series, which consists of various Frida Kahlo-inspired personalities. Kenesha Sneed’s minimalist and desert-inspired wares perfectly capture the California aesthetic. While working as a motion graphics designer and art director, Sneed took up ceramics and quickly fell in love with the art form. Ultimately, she decided to make the hobby her full-time profession. Sneed launched her e-shop, Tactile Matter, in 2012 and quickly gained a loyal following, even catching the attention of Solange, who commissioned the artist to create an exclusive ceramics line for Saint Heron Store. We fell in love with Eunbi Cho‘s unexpected designs at Giorgi Porgi, a sleek coffee shop tucked away in DTLA that commissioned Cho to create its gravity-defying coffee mugs. The Korean artist’s tagline—”Made For Play”—is a fitting description for her fun, functional pieces that can pretty much double as fidget toys. Rochefort’s wild designs are better suited as centerpieces for your coffee table than as mugs for your morning coffee. His “Energy Gloops” series is a masterful study of texture and color, artfully blending organic-looking forms with artificial coloring, making the pieces simultaneously reminiscent of volcanic stone and a bowl of melting ice cream. Ben Medansky can turn any utilitarian vessel into a geometric masterpiece. His mugs are instantly recognizable, usually featuring bold, clean shapes and exotic handles glazed in neutral or dark tones. The artist’s work is inspired by Brutalist and Modern architecture, as well as his interest in technology and space. His pieces have a distinctly industrial vibe, said to be a result of the time he’s spent in DTLA. Julia Haft-Candell is best known for her contorted pretzel-shaped ceramics which she creates to explore the “the absurd excess of the universe.” You can catch a glimpse of her work in person at the Craft and Folk Art Museum‘s exhibition “Melting Point”—on display through May 6—and if you keep an eye out, you can snag one of her ceramic mugs at the random pop-up sales she hosts in Echo Park. Brooke Winfrey makes whimsical wares under the name btw Ceramics, the company she founded in Brooklyn and later moved to Los Angeles. 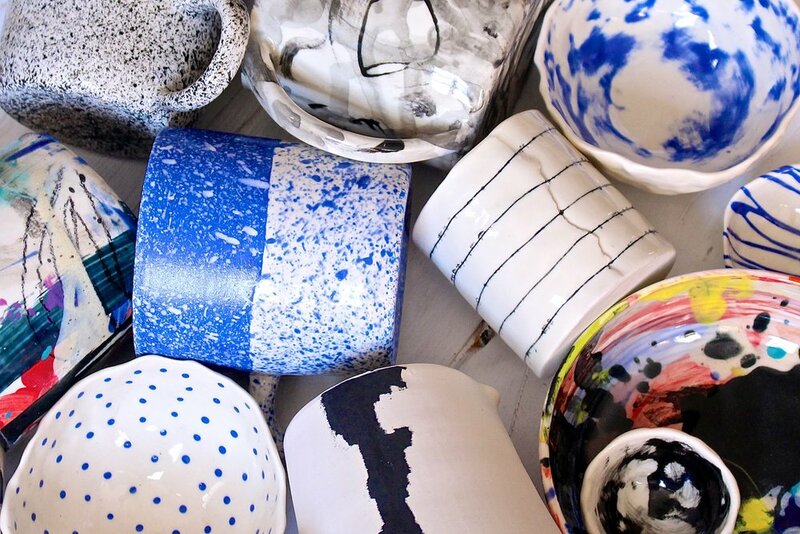 Whether its paint splattered dinosaur bowls or sleek black-and-white porcelain mugs, her one-of-a-kind designs will instantly elevate your ceramic collection. South L.A.-based brand Humble Ceramics is true to its name—soft and subtle shapes glazed in off-white colors create understated, timeless pieces. The beauty lies in the simplicity and precision of all the designs, which act as the perfect canvas for chefs around town. You may have had a bite off one of their plates at P.Y.T., Providence, or other spots around the city.